Profile (Jero Wijaya) Canyonlike Batur Caldera, Mt Batur (Bali Indonesia). It’s my pleasure to introduce this volcanic geomorphology to you. My name is Jero Wijaya, after working for several jobs since last decades. I decided to be in communication with my clients before they join the unforgettable volcanic exploration encircling the huge Batur Caldera and the inner. I am designing the multiple exploration trip in Bali presently. Adventure tours, unless you are on the trip of geographical acknowledgement and cultural segmentation in Bali. Expanded Bali exploration is also available with our travel service. I am sure you need our assistance in order to explore the entire places. After involving myself deeply in the tour guiding effort, I started to elaborate my experiences into the advanced tourist destination too. Popular tourist destination; visiting temples, volcanoes are the advanced tours are provided with us. Current to present period’s geological history has been developed time to time such volcanic activity development. This volcano currently raised up from the center of the double concentric caldera 13x10km and, situated on the volcanic island (Bali), it is situated on the part of the magma outlet emitted from its pocket at the Pacific Ring of Fire from the Indian Ocean, Indonesia, Philippine, Japan, Alaska, Canada, USA, Mexico and South America encircles the Pacific Ocean with North East movement fire ring underneath. Exploring these widespread volcanic islands with scientific knowledge is interestingly brilliant option and great experience. Back to the Batur Caldera, our trip to this volcano is designed to be avoidance from the night traffic local driver and, we are confidently suggesting you to enjoy the specialism of hot spring bath before hiking up the volcano on the freezing morning and overnight in Toya Bungkah. Various volcanic segmentation are interestingly rich in pragmatic materials such: volcanic Igneous rock which is found mostly in the present parasitic cones and the lava fields with the igneous, metamorphic and sedimentary rocks outlet exited in these craters. Generally, volcanic eruption creates entire fertile ash and soil which is great for the agricultures, it causes the land rich in vegetative crops and, agricultural products become great opportunities for present prosperity and causes outsold products increasing to the entire Bali and further islands for the public consumption surlier. Reserving your night lodge including Mt Batur sunrise packages is a smart idea regarding of avoiding hassles. The temperature on Mt Batur’s top in the morning occurred between 0-15 F, and often freezing, you are advised to take extra warm cloths and trekking shoes with you in order to avoid yourself from cold weather. Hot Spring bath before hiking up the volcano due to heal your body up and you will feel warm after bathing in a brilliant idea. Our confidential offers are: hiking, climbing several mountains and various ecological forestry treks which have been in operational tourist activities since 30 years. It's clearly notified every change of landscapes have difference values. Batur Caldera adventure, fantastic stunning; spectacular viewpoints including the wide range of volcanic landscapes are the colorful segments. This is why my intention to introduce these places canyonlike caldera to you and keep in sustainability environmental development. Most visitors, local and international are coming to visit this place in regular chances, they are coming for the Mt Batur sunrise with lack article tours or financial subject dominance. 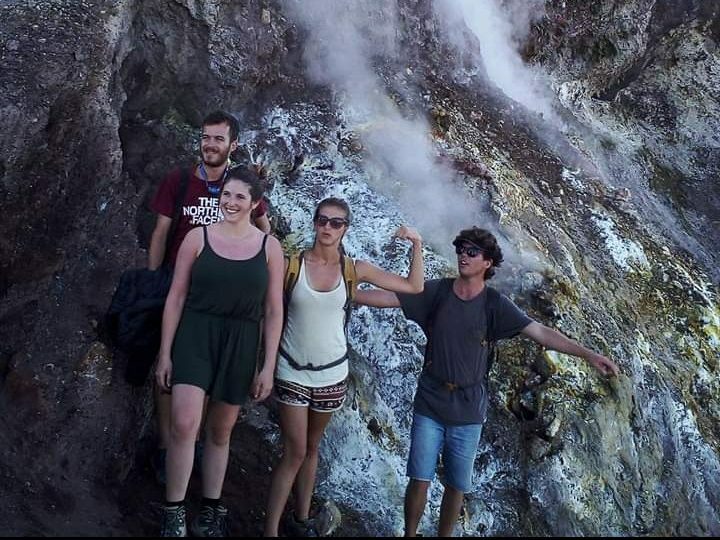 They don't have any special acknowledgment of the volcanic material and characters for you, though we know more but we are honestly assisting our clients with long term reservation, you won’t be satisfied visiting a volcano if finding correct information without consideration. Villages Inhabitancy: Both outer and inner caldera is populated and includes the six main villages; Kedisan, Songan A, Songan B, Trunyan, Abang and Buahan, and further between outer and inner caldera is populated includes Belandingan and Pinggan villages. While on the rim of the caldera lateral and nearby is populated and includes Siakin, Sukawana, Kintamani and North-Middle and South Batur. Community the 13 x10 km caldera, the collapsed strato-volcano 29,300, 20,300 years ago. Stunning views of Mt Batur 1717m at the inner caldera erupted in: 1804,1849, 1888, 1917, 1963, 1974, 1999, 2000. The lava field from the 1968 eruption is still viewable today from the western mouth of the caldera rim, interestingly I was there watching the eruption in 1974. The Western part of the caldera rim has a spectacular view of black lava fields on the West of Mt. Batur, these lava fields are flowed out from the lower craters. Here is also an area of sandy and shingles volcanic debris where you can join the motor-cross on the lava fields and volcanic sediments. The 1963 eruption of Mt. Batur produced millions of cubic meters of volcanic debris, sands and ash from pyroclastic lava erupted from Batur parasitic cones. Geographically, village settlements are randomly localized from current communities where people live with their own families. The geospatial modelling, settlements in this village commonly tolerance, they have cooperated one with another in village’s community regulation, collectively and acceptable concepts. The village settlement or communities here, with a population ranging from thousands, remained in old heritage villages system. For example cooperatively when someone felt sick in the community, the other members of the villages are involved in gatherings themselves for helping each other. Still alike to the past, villages built their societies for their own communities to accommodate the subsistence and other community demands. They did not have been eclipsed in importance responsibility such uniting human society and settlement here to cooperate themselves. Balinese belief and culture started when Hinduism was brought mainly from India to Indonesia about 2000 year ago and collaborated with Indonesian Hindus became powerful of Hinduism and Buddhism before the Islam too over Indonesia. Bali was influenced by the Javanese Culture that is still occurring today. Hindu Kingdoms in West, Central and East Java had their great influence to Bali around 400 AD, after the time Islam came in the Hindu Kingdom in Java underwent lost in power, since time, a number of priests migrated to Bali such the missionaries of Hindu refugees. Artists and their followers refused the new religion and escaped to Bali. They blended their belief and traditions with the local people, a blend of which is inherited by the present Balinese, the rich culture which is instead of the scenic beauty of the island, has attracted more visitors constantly from time to time. Their stronghold religion and traditions may be the prime factor to enable them to preserve their culture from the overseas influences. The Balinese peoples today still adopted Javanese culture especially languages from old Javanese literature, Kawi language and Sanskrit language are still useful today. Most old Balinese though they are descendant of Javanese migration they don’t recognize the language used today which is dominantly coming from outside Bali.